The rain-drenched residents of the Cascadia region  roughly from Oregon to southern British Columbia  probably assume that earthquakes are something for their neighbors in California to worry about. But Cascadia sits on top of major faults, and although it doesn't get hit very often, the region has seen massive quakes before. The most recent one was in 1700, when a megathrust earthquake that may have been as severe as 9.2 on the Richter scale struck the region. 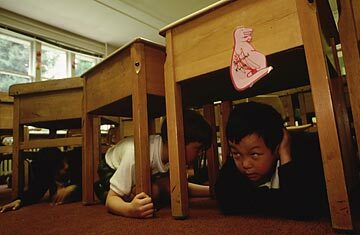 The geologic record indicates that a catastrophic quake hits Cascadia only about every 500 years, but the cities of the Pacific Northwest, like Seattle and Vancouver, are far less prepared than San Francisco and Los Angeles for a major earthquake, so when the next powerful temblor comes around, the region could suffer. Read "How Disaster-Ready Are We?"